Therapeutic proteins are of such clinical importance that they are undergoing accelerating development. Despite advances in various product categories, difficulties remain. A particularly daunting challenge is the expression of highly glycosylated recombinant therapeutic proteins, such as blood coagulation factors or serum proteins. Human cell lines, such as the HEK293 cell line or Cevec’s amniocyte production (CAP) cell line, have been shown to be efficient in producing and secreting such complex proteins. In addition, they are a safe alternative to nonhuman mammalian cell lines, such as CHO cells, because of the absence of immunogenic post-translational modifications or immunogenic nonhuman host-cell proteins. However, glycosylation can at times be incomplete in all these cell lines. Incomplete glycosylation can lead to, for example, unfavorable pharmacokinetics of the target protein. A striking example of this is the recombinant human C1 esterase inhibitor (C1 Inh), a highly relevant therapeutic molecule that so far has displayed a strongly reduced serum half-life. C1 Inh belongs to the serpin superfamily. Its main function is the inhibition of the complement system to prevent spontaneous activation. The 500-amino-acid protein is highly glycosylated with seven predicted N-glycans and eight predicted O-linked glycans. Plasma-derived C1 inhibitor (Berinert from CSL Behring and Cinryze from ViroPharma,) as well as recombinant C1 Inh derived from the milk of transgenic rabbits (Ruconest from Pharming) are approved for the treatment of acute attacks in patients with hereditary angioedema (HAE). However, the recombinant product shows a dramatically reduced serum half-life in pharmacokinetic studies in comparison to the plasma-derived counterparts. This reduction is most likely due to the asialoglycoprotein receptor, which recognizes terminal galactoses on glycans, facilitating rapid hepatic clearance. Although there are indications for the use of recombinant C1 Inh with reduced half-life in acute episodes of HAE, an alternative to plasma-derived C1 Inh for long-term treatment of HAE would be desirable, as plasma-derived products still occasion strong concerns with respect to safety and availability. Moreover, C1 Inh is in clinical development for indications other than HAE, such as reperfusion injury, organ transplantation, and inflammation. The currently available plasma-derived C1 Inh medications will not be available in sufficient quantities to satisfy the demand arising from such new applications. Figure 1. 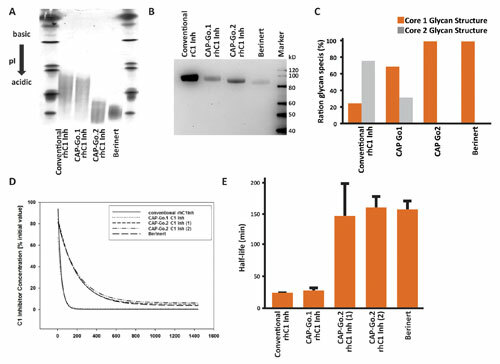 Expression of recombinant human PLAP in CAP-Go.1 or CAP-Go.3 cells results in glycoproteins with increased sialylation of N-linked glycans and significantly increased serum half-life. (A) An isoelectric focusing analysis of purified rhPLAP indicating a higher degree of sialylation when expressed in CAP-Go cell lines. (B) A pharmacokinetic study of the same rhPLAP proteins in rats, comparing serum half-life. We genetically modified the CAP cell line to confer optimal glycosylation to highly complex glycoproteins such as C1 Inh. This work has resulted in a panel of improved cell lines, CAP-Go cells. Among these, the CAP-Go.1 cell line has been modified to facilitate expression of proteins with fully sialylated N-linked glycans. Recombinant proteins such as human alpha-antitrypsin or human placental alkaline phosphatase produced with CAP-Go.1 exhibit a significantly prolonged serum half-life in rats (Figure 1). Thus, for these molecules, an optimization of the N-glycans is sufficient to improve pharmacokinetic properties. However, when human C1 Inh is expressed in CAP-Go.1 cells, this has no positive impact on the pharmacokinetic profile (Figures 2D & 2E). Further analysis of the post-translational modifications of the produced C1 Inh in CAP-Go cells identified a close similarity of the N-glycan structures compared to plasma-derived C1-Inh, but for the structure of the O-glycans, differences were observed. Additional modifications of the CAP cell line resulted in the CAP-Go.2 cell line. 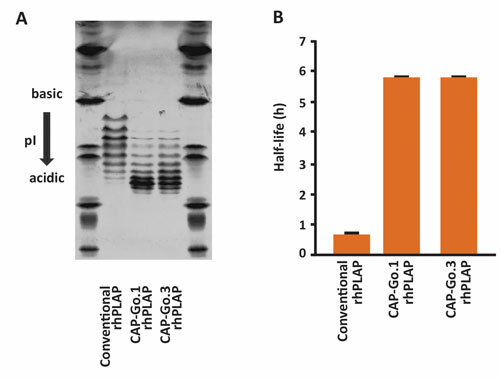 Recombinant human rC1 Inh expressed in CAP-Go.2 cells has a serum half-life that is significantly greater than that of the counterpart protein generated on a conventional expression platform, and is actually indistinguishable from that of the plasma-purified protein. (Figures 2D & 2E). While rhC1 Inh proteins expressed in either CAP-Go.1 or CAP-Go.2 cells both show a similar reduction of free terminal galactose on N-linked glycans (Figure 2B), their O-linked glycans differ. Analysis of the O-linked glycans shows that rhC1 Inh expressed by CAP-Go.2 cells, but not CAP-Go.1 cells, contains only core 1 O-linked glycan structures, highly comparable to plasma-derived Berinert. Overall, glycans of recombinant C1 Inh expressed in CAP-Go.2 cells are more homogenous than the glycans found on conventional recombinant glycoproteins. The resulting low batch-to-batch variation has a strong positive impact on large-scale C1 Inh production and leads to reduced downstream costs due to high expression of the recombinant protein with the desired glycoprofile. In addition, no nonhuman glycan structures could be found in the preparations. Further characterization of the protein with respect to specific activity using a chromogenic assay showed comparable specific activities of CAP-Go.2-derived and commercially available plasma-derived C1 Inh (data not shown). Figure 2. Expression of recombinant human C1 Inh in CAP-Go.2 cells results in glyoproteins with increased sialylation of N-linked glycans, homogenous core 1 O-linked glycosylation, and significant increased serum half-life. (A) Recombinant proteins were produced using the indicated platform, purified and subjected to isoelectric focusing analysis in comparison to plasma-derived Berinert. (B) Lectin blotting was used to compare the degrees of sialylation between different CAP-Go cell lines and hC1 Inh from human serum (Berinert). Erythrina cristagalli lectin binds to terminal galactose on N-linked glycans, and that sialic acid prevents the lectin from binding. Therefore, a decrease in signal intensity indicates an increase in sialylation. (C) MALDI-TOF mass spectrometry was used to analyze the C1 Inh O-linked glycans of protein expressed in CAP-Go.1 or CAP-Go.2 cell lines in comparison to Berinert. (D & E) C1 Inh preparations were injected intravenously at 10 mg/kg into female Sprague Dawley rats. Residual C1 in plasma samples taken at the indicated time points was analyzed by ELISA, and the half-life was determined by direct fit. Our results indicate that in addition to N-glycosylation, the structure of O-linked glycans also plays a crucial role in pharmacokinetic properties of glycoproteins. rhC1 Inh expressed from CAP-Go.2 cells that are optimized for the expression of N- and O-linked glycosylated proteins display glycan patterns closely similar to plasma-derived C1 Inh. The resulting molecule has a significantly prolonged serum half-life as compared to its counterpart generated on a conventional human cell line. Our new recombinant molecule matches serum-derived C1 Inh in all the aspects analyzed: specific activity, serum half-life, and glycosylation patterns. Additionally, CAP-Go.2 cells offer the advantage of being producible at large scales on a safe platform. Because the cell line is compatible with high-titer, scalable processing, it could produce C1 Inh in relative abundance, a market supply sufficient even for additional treatments, which so far cannot be served by plasma-derived products due to limited access. Silke Wissing, Ph.D., is director of cell line development, Jens Wölfel, Ph.D., is group leader of downstream processing and analytics, Helmut Kewes, Christian Niehus, Corinna Bialek, and Sabine Hertel are research assistants, and Nicole Faust, Ph.D. (faust@cevec.com), is chief scientific officer at Cevec Pharmaceuticals.